The Xtreme Fighting Championship (XFC) came to New Mexico for the very first time last night and the Florida base promotion got a glimpse of what New Mexico fight fans are all about. Albuquerque is debatably one of the “Mecca’s” of mixed martial arts. The area is a hot spot for some of the best fighters competing in mixed martial arts competition today. The truth is that with gyms like the Jackson-Winklejohn gym which is headed by world famous coaches Greg Jackson and Mike Winklejohn, the city is full of premier talent from within that gym as well as surrounding gyms. The area of Albuquerque and surrounding towns like Rio Rancho and Santa Fe have some of the most talented champions, prospects and veterans competing for small promotions like King of the Cage and top promotions like the UFC. The XFC promotion is a promising company that has blossomed over the last year to really become one of the prominent shows traveling the country. New Mexico was the promotions first stop outside of the east coast and they brought with them a title fight and several bouts featuring the areas most popular fighters. One of the themes emerging from the evenings festivities was that XFC’s top guns John Prisco and T.J. Alcock really took the time to capture the small details of fight promotion. SWFight.com was grateful that the promotion featured our logo (as well as the LowBlow logo) on their cage. Those small details really make it enjoyable to work hard to aid the effort and support that goes into being members of the media. An apologetic Angelica Chavez addressed the crowd concerning her late scratch from the crowd. The Biggest Pop of the Night award goes to Joby Sanchez of the Chavez Dojo as he had the crowd roaring inside the Albuquerque Convention Center when he began his walk down to the cage. It was the loudest the crowd would ever get and it was truly one of those moments that can raise the hair on the back of the neck. The hometown fighter came in and put on a show against Eric Moell. From the highlight kick to the knockdown, Sanchez was spectacular throughout. He was able to get an emphatic finish and really cemented his status as one of the state’s premier talents. Speaking of the Chavez Dojo, they came out in a giant herd to represent and cheer on their gym and fighters. There was a sea of red right smack in the middle of the bleachers. It has become the Dojo’s reputation to always bring a huge support system into event’s featuring their fighters. Many can recall the MMA Fight Pit that saw several hundred screaming fans roaring for Angelica Chavez back in 2011. The card lost Chavez a day before the event and that was a real pity as she is one of the most popular figures in the area. Not only was the fight with Skinner an intriguing one but it was also a welcomed homecoming for Chavez who hasn’t fought in the area since that aforementioned bout over two years ago. The main event of the evening saw Team Four Corner’s fighter Angela Magana come very close to snatching the Strawweight Title. Magana fought smart and implemented a flawless gameplan in the first round. While her opponent Eggink was longer and touted as the better boxer, Magana used excellent footwork and showed a mastering of the necessary head movement to avoid a boxing heavy attack. She landed leg kicks at will as well as a brutal overhand right that was thrown perfectly to accommodate a taller opponent. Despite succumbing to the second round submission, Magana showed once again why she is one of WMMA’s most underrated talents. Champion Stephanie Eggink has now defeated Heather Clark and Magana, both of which have fought of New Mexico. I am curious to see who she is paired with in the future and if an evitable showdown with a third New Mexico WMMA fighter is in her future. Alchemy BJJ and Judgement MMA’s Josh Montoya wasted little time in dispatching Ed Tomaselli. For those fight fans locally who know Montoya and his career they understand that while being in his young 20’s, Montoya has more experience in this sport than most fighters near or past 30-years old. His ground game remains dominant and he showed his ability to change the course of the fight with his striking when he sat Tomaselli down with a thunderous right hand. Montoya now has 19-professional fights in just over five years of competition. The term “heart” is thrown around a lot when discussing combat sports and it is often over used on fighters that absorb punishment and still lose the fight. Jackson-Winklejohn fighter Landon Vannata showed what the term really means. After a razor close first round, Vannata looked out of rhythm in the second round. Heading into the final round, Vannata may have been tied at one round apiece with opponent JP Reese or been down two rounds. He came into the third round with a chip on his shoulder and despite appearing to be very tired, pushed through with high volume offense. He would take home the split decision win in a fight that was all about the will to win which Vannata had in bundles. Keeping with the Vannata fight; when will you ever see a 2-0 fighter cornered by Greg Jackson, Mike Winklejohn, Brandon Gibson and John Dodson? If his all-star cornering team is any sort of indicator, Vannata has a bright future ahead of him. The fight between FIT NHB’s Tim Sosa and Demotion Fight Team’s Jordan Espinosa on paper was guaranteed fireworks. However, Espinosa’s wrestling was clearly the game changer as he quickly took Sosa down where he locked in a D’arce choke that appeared to be a modified North-South Choke in just over a minute. While the loss sets Sosa back a little bit, he is still young in his professional career. For Espinosa, the win over one of New Mexico’s most accomplished amateurs propels his name into talks of being a true blue chip prospect in the regional circuits. Martin Manrique took a dominant decision over Francisco Marin to start the show. The Mean 1 MMA fighter showed very powerful and effective ground striking while really dominating position over the course of the fifteen minute bout. While the bout had its slow moments, Manrique really showed why wrestling is the strongest base in MMA as Marin wasn’t unable to showcase any of his striking talents. The main card featured several non-local fighters and most of which failed to “wow” the crowd the way the preliminary fights did. The highlights of those fights included an impressive flying armbar from Ryan Thomas and a fun, tactical battle between Farkhad Sharipov and Stephen Bass. In the most anticipated bout of the fight card, Ricky Rhainey and Dhiego Lima may have shown the effects of elevation change as both fighters were unusually slow paced and tired uncharacteristically quick. Despite that, the Judge’s turned in a very controversial decision awarding the bout to Lima in a fight that Rhainey controlled more often than not. As mentioned before, the preliminary fights stole the show despite the main cards being very solid. 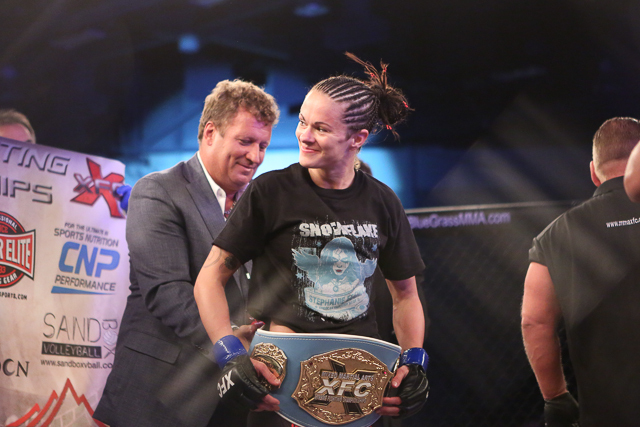 All in all, the XFC 25 event was entertaining and well coordinated. If the XFC chooses to come back to the area they are sure to have secured a fan base that will return for an encore show. Our local fighters fought well even though some didn’t return back home with a victory. Regardless, the event cemented itself a place in the legendary history of New Mexico MMA.